Like inventory options, products can have line items (like taxes) associated with them. To add line items to products, navigate to the product’s edit page. 1. Click Add Line Items. 2. Select from your existing line item bundles (1) if you’ve already created an appropriate line item. If not, continue to add a new line item. Give the line item a label (2). If the line item is a tax, check the box labeled This is a Tax (4). Taxes don’t add to each other, only the subtotal of the order and any non-tax line items listed above the tax. If the line item should be multiplied by each group member, check the box labeled Multiply (5). 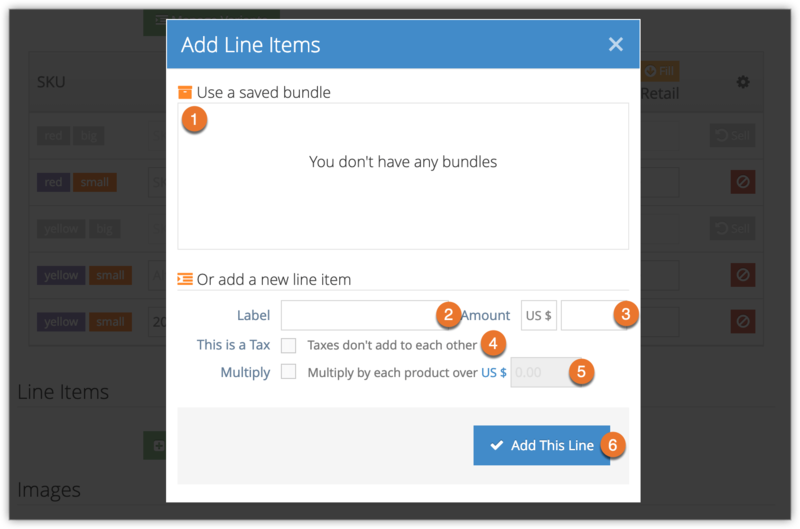 For example, if there are five products listed in the order, a line item with Multiply checked will be multiplied by five. You can also specify an amount over which the line item should be applied, so if you have lower-cost products that don’t use this line item, enter an amount higher than their cost. Click Add This Line (6).